The Orion Shopping Festival is back, marking the beginning of the festive season inspectacular style. 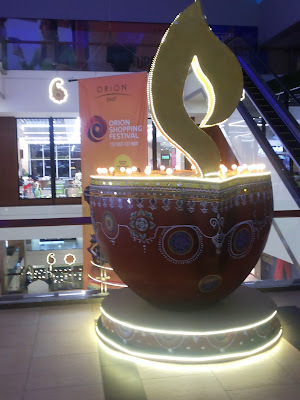 What’s more, this time it’s twice as exciting as both Orion Mall at Brigade Gateway and Orion East Mall celebrate this mega shopping festival, packed with superlative shopping experiences, fantastic prizes for shoppers and grand bumper prizes, all amidst festive gaiety and dazzling décor. 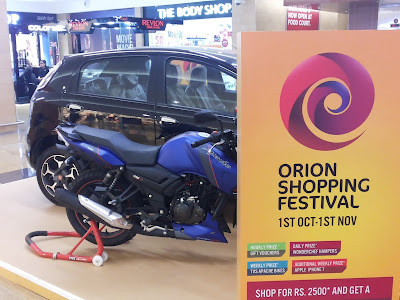 During the much-awaited Orion Shopping Festival, from October 1 to November 1, 2016, customers at Orion Mall, Brigade Gateway, who make purchases of Rs. 4,000 and above can participate in hourly, daily and weekly draws. At Orion East Mall, customers making purchases worth Rs.2,500 and above can participate in these draws. The bumper prize at both malls is a coveted Fiat Abarth Punto cars, while winners of the weekly prize can ride home on a TVS Apache bikes; at Orion East, there are also Apple iPhone 7 being given away during the weekly draws. The daily prizes are delectable Wonder chef hampers. That’s not all — shoppers can win gift vouchers in the hourly draws as well. Brigade Gateway Campus lit up splendidly for the Deepawali seasons. Certainly, the festive decorations take the Orion Shopping Festival to another level for shoppers, it introduces a whole new festive shopping experience to customers at Orion East Mall, a destination that redefines the concept of the neighbourhood mall. Cutting edge innovation and fine aesthetics combine to create fantastic festive effect sat both malls – from huge lamps to sparkling elephants, Canopy lights cover the facades and light spark fountains scattered across the campus make for a beautiful sight. A gorgeous setting, great shopping and grand prizes – it’s the perfect way to herald the festive season. So, come join the celebrations.